General Admission seating for the free concert. 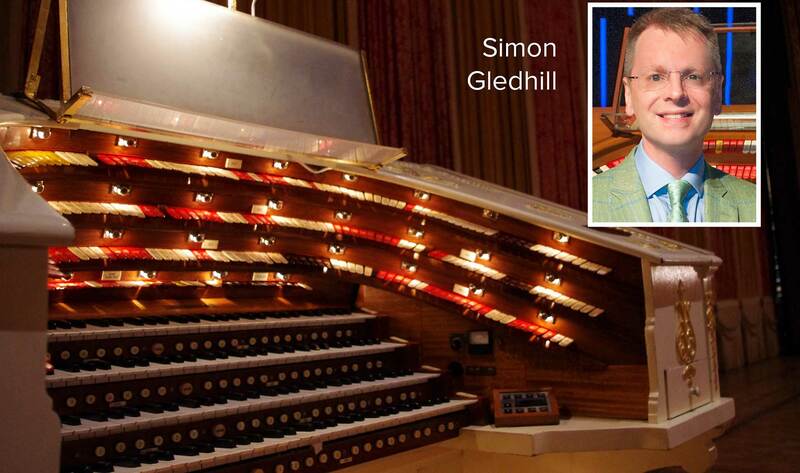 Simon Gledhill is widely recognised as one of the world’s finest theatre organists, with a career spanning 36 years and a reputation for performances which combine dazzling technique with creativity, imagination and musicianship. Simon was born in Halifax, UK, and showed a keen interest in music from an early age. He started learning to play the piano accordion at age six and continued with that instrument for 11 years, winning several competitions along the way. When he was 10 years old, his parents purchased a small electronic organ. After initially teaching himself to play it, he began formal studies with a local teacher, Michael Woodhead, who also gave him extensive tuition in classical organ and piano. Simon’s first “live” experience of the theatre pipe organ was seeing and hearing Ernest Broadbent play Britain’s most famous Mighty Wurlitzer at the Tower Ballroom in Blackpool. A short time afterwards he discovered a privately-owned instrument close to his home, and was soon making weekly practice visits. In 1982 he entered and won the UK Northern Young Theatre Organist of the Year competition. Nigel Ogden, presenter of the BBC radio programme The Organist Entertains, was in the audience, and invited him to record for the programme on the BBC Theatre Organ. The resulting broadcasts generated a flurry of concert offers, and Simon has since performed at all the major UK theatre organ venues, as well as touring in Europe, Australia, New Zealand and North America. He has played many times for the American Theatre Organ Society, and was named ATOS Organist of the year in 1997 and inducted into the Society’s Hall of Fame in 2015. Simon has performed at the Ohio Theatre in Columbus before, in October 2000, and is delighted to be returning to help celebrate the 90th anniversary of the theatre and its splendid Robert-Morton pipe organ. Simon combines his concert and recording activities with work for the Cinema Organ Society, the UK’s leading theatre organ preservation group, and a full-time career in finance, based in London. Learn more about Simon Gledhill here. A native of Ohio, Clark Wilson began his musical training at age nine. While growing up he accompanied numerous stage musicals and was organist at several churches. At this time, he was listed in “Who’s Who in the Midwest” and “Men of Achievement”. He also holds Life Member status in the International Tri-M Music Honor Society and is listed in “Who’s Who in Executives and Professionals." Clark’s recording credits include seven albums. He has given all-transcription recitals for the AGO, played for the 1990 Organ Historical Society convention, and performed at numerous National and Regional conventions of the ATOS, as well as giving a series of highly lauded workshops for young people’s Pipe Organ Encounters. Considered one of the finest practitioners of the art of silent picture scoring, he has also been a visiting lecturer on Theatre Organ and photoplay accompaniment for the Indiana University organ department. He has now developed curriculum and has been appointed to the organ faculty at the University of Oklahoma's Organ Department, where he teaches applied theatre organ lessons, silent film scoring, and the history of the American theatre organ. He has concertized in the United States, Canada, Australia, and England, and done extensive silent film accompaniment, including at the Chautauqua Institution in New York, the Packard Foundation’s Stanford Theatre, UCLA, and the Fox Theatre for the Atlanta premier of the restored “Metropolis”. He plays a silent picture annually on the organ series at LA’s Walt Disney Concert Hall, has scored for Kino International for commercial release, and has performed at both the Cinequest and San Francisco Silent Film Festivals, as well as for the Los Angeles Conservancy. Since 1992 Clark has served as Resident Organist and organ conservator at the famed Ohio Theatre in Columbus, Ohio (for the Columbus Association for the Performing Arts) and was chosen by them to re-premier the renowned Chicago Theatre Organ on a bill that included him accompanying popular singer Michael Feinstein. He also headed the professional crew that began restoration on the Chicago’s landmark Wurlitzer for CAPA. Learn more about Clark Wilson here. Built by the Loew's and United Artists movie theater chains, the Spanish Baroque movie palace opened on March 17, 1928. It featured its own orchestra and Robert-Morton theater organ (still in use today). Organist Roger Garrett continued to perform daily at the "Mighty Morton" until 1944, when Roger Garrett was inducted into the army, live organ music was discontinued. In 1966, members of the American Theatre Organ Society began restoring the Robert Morton and playing the organ for shows again. Loew's closed the theater in 1969 and it was threatened with destruction before being saved and renovated by the Columbus Association for the Performing Arts (CAPA). The original building was completely restored during the 1970's. The Ohio Theater was declared a National Historic Landmark in 1977. Once these magnificent instruments were common through the country (in the 1920s, there were more than 10,000 theatre pipe organs in operation). Today there are fewer than 40 surviving pipe organs in their original installation. Today the organ is considered one of the finest theatre organs in existence anywhere. The magnificent Morton Theater organ was installed in 1928.